Double posted from the oringal thread over at the Tavern. I used to be all over this style of play in my teen years. Mainly when I was playing Basic/Expert D&D and AD&D 1st ed. Heck I even wrote a three levels of megadungeon, which is imho the ultimate sandbox. Happy hours playing through Isle of Dread. Here’s a piece of hexpaper and off you go. Problem was that I always felt the players missed all the good stuff. I started getting peevish about it. Ok so you are going to miss the Ancient Red Dragon in the Volcano which I’ve put in plan sight, I’ll put five in your way on my latest hex crawl Playing Griffin Island during the generic pre-Glorantha Games Workshop RuneQuest years was probably my last hurrah for Old School Sandbox play. My current game FAE Cowboys & Dinosaurs is a Sandbox, that takes in the whole Hollow Earth, but the players are unaware of it. They are just hitting the trail and having fun times Also I’ve got unfinished business with the Spires, the setting of which I revealled but a small corner of it the Blood of the Dragon for Crypts & Things (watch this space). 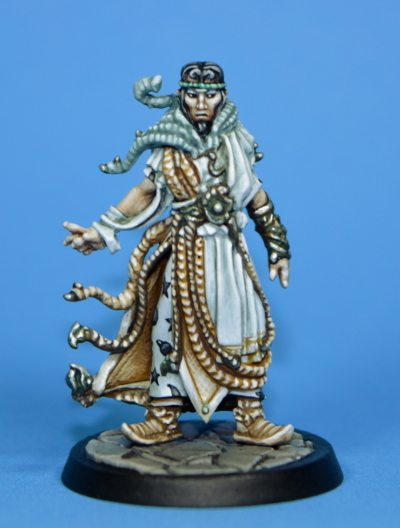 The Warlock of Firetop Mountain – in Metal! I got news of this from Andrew Scott’s Realm of Chaos blog, and as well as more figures coming from OtherWorld minis, there’s going to be another range from a company called Pure Evil who apparently will be Kickstarting their range soon. 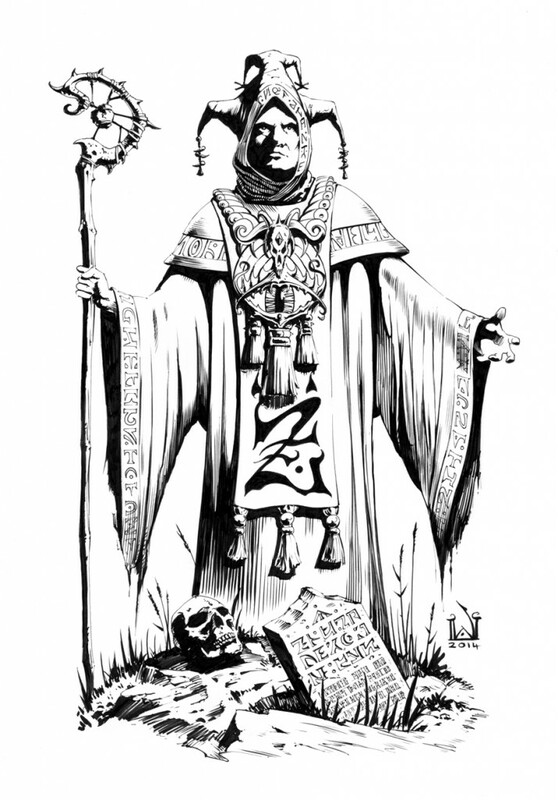 Over at the Tavern Forum, Tom Zunder has a short write up of his RQ 6 campaign Tales of the Blessed City. Being a chronicle of the perspicacious adventures and tremulating exploits of three perambulating personalities of the convivial conurbation that personates itself as “Fayoval, Blessed City of the East”. This is a RQ6 game, largely RAW, and run face to face on alternate Thursdays. Toc, Shaman of the exiled Sylvings and retainer of House Marozzo, played by the illustriously legal Andrew Watson. Antonio di Marozzo, of the House Marozzo, notable youth and duelist of the Equestrian class, played by the fastidious revenue agent Duncan Rowlands. Baptiste, sometimes madam and sometime concubine in the Walled Quarter of Gems, played by the ever teenage Monster Heart, Neil Gow! Our story starts one hot and sunny endless day in the days of the Twinight, when the solar radiance of the orb above us blazed all the hours of the day and at a time when the sunburnt, eye strained and sleep deprived folk had almost forgotten the meaning of the word ‘day’. 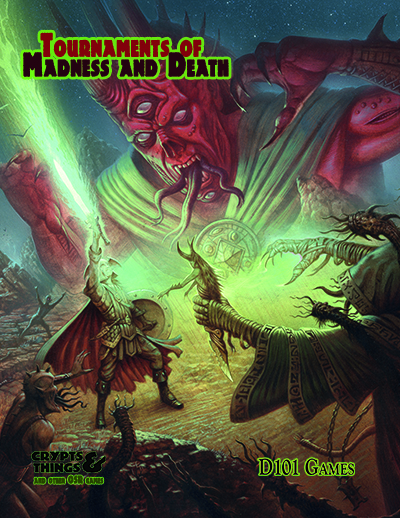 A quick mention here, due to its D&D leanings, the 13th Age in Glorantha Kickstarter has gone live. So John Dever and Cubicle 7 have teamed up to bring a new version of the Lonewolf RPG to market and they have a Kickstarter to bring it into being. The initial goal, long pasted, was to create a box set suitable for beginning players, with subsquent supplements (already in the pipeline and available in the reward levels or as add ons) building on that for the more mature gamers. The Lone Wolf game books were a big part of my gaming teens in the 80s, and while more story orientated than Fighting Fantasy they had a unique feel and tone to them which really set them apart. An here’s one of the jaw dropping gorgeous maps that Cubicle 7 commissioned for the game. If you think I’ve forgotten Crypts and Things.. I haven’t. Zarth has not plunged into the red sun Nemesis and there’s still very much (un)life in the Game. As a teaser part of a little something that David Micheal Wright is working on for me. David did the lovely cover of Tomb of the Necromancers.